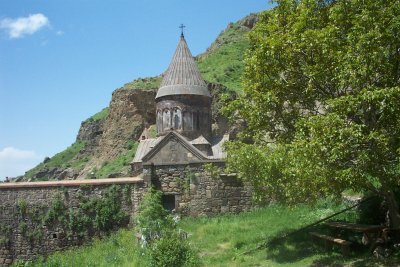 The Monastery of Geghard and the Upper Azat Valley has been named a WHS for the influence it had on Armenian monastic architecture. While the main chapel was built in 1215, the monastery complex was founded in the 4th century by Gregory the Illuminator at the site of a sacred spring inside a cave. 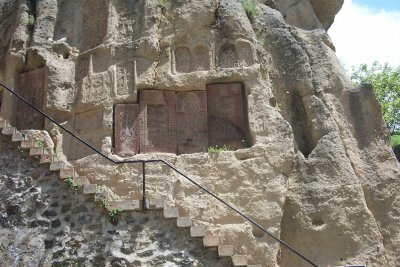 The complex is carved into the side of the mountain. It consists of several churches, tombs, a defensive wall and carved out crosses (khatckars). Geghard is the Armenian word for lance or spear, reflecting the legend that it housed one of the lances that was associated with the crucifixion of Jesus Christ. Geghard monastery has a great setting, amidst rocky mountains. The dark grey monastery is a popular daytrip from Yerevan (often combined with the pagan-but-completely-rebuilt Garni temple), and also for schooltrips as I noticed. I took a guided tour here, which gets you more out of a visit (as displays in English or good guidebooks are non-existent). Part of this monastery is hewn out of rocks (a bit similar to Lalibela). Inside, its rooms are dark, sober and cool. There are also caves left where monks prayed. Numerous khatchkars (stone crosses) are placed among the rocks. What I liked best (besides the wonderful location) were the delicate carvings on the in- and outside of the main building. For example, the coat-of-arms relief in one of the rock churches. Also, the door in the main building is exquisite. There are a lot of Arabian influences in this work, telling of another chapter of Armenia's turbulent history. 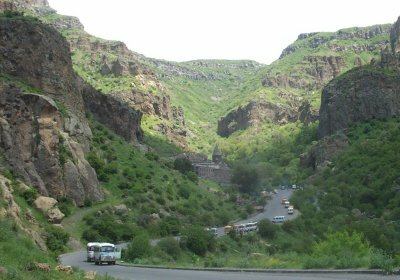 I was at Geghard in 1978. When we (The lady I was with and myself) walked towards one of the cave entrances we heard the sound of a flute. While entering, the echo of sounds took us in such a way that we entered into the "room" with goose pimples on our body and tears in our eyes. An experience I'll never forget. Note: At that time there still was a problem with exercising ones religion. This lady was playing Armenian Religious Music! We did and have no regrets at doing so. The Armenian church lies at the heart of this country’s uniqueness (together it should be stated with its alphabet/language and the sense of “difference” and “oppression” which its geographical location and history of persecution and survival have given it) and seeing its monuments and the people worshipping in them is an essential part of gaining a feel for the country.